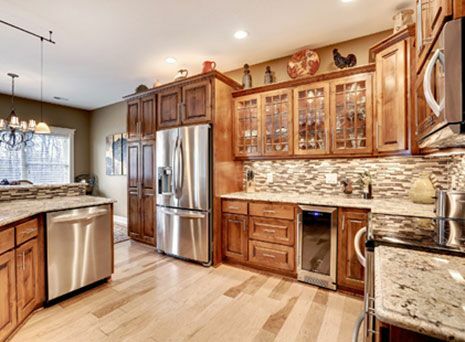 Locally-owned and operated McChesney Cabinets provides the highest-quality custom cabinetry available for both residential and commercial locations. We design, build, and install cabinets and other projects customized to fit your home and your style. Any drawing or design can be modified to your specific needs for your new construction or remodel project. For many households, the kitchen is the main gathering space, the place where families spend the most time. 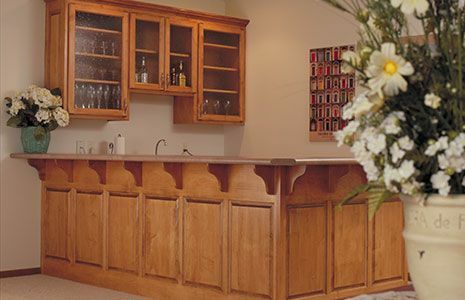 For new home construction or a kitchen remodel, look to the expert cabinetmakers at McChesney Cabinets. Our quality custom cabinets not only serve an important purpose, but offer beauty and style for an inviting atmosphere. We can modify any design to accommodate the most specific needs. Enjoy the convenience of a pop-up mixer stand, recycling roll-outs, built-in spice or wine racks, and much more. We’ll bring your dream kitchen to life. 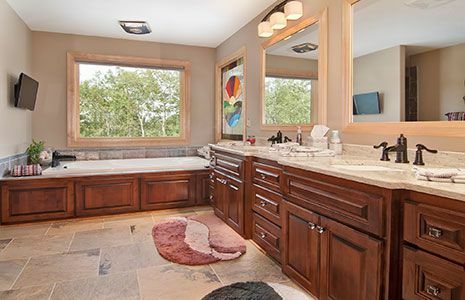 The cabinetry experts at McChesney Cabinets can build and install custom cabinets and storage solutions for bathrooms of any size and any style. From vanities to linen closets, we maximize available space for improved functionality, combined with outstanding design and quality. Relax and enjoy custom cabinets and storage solutions in your family room. 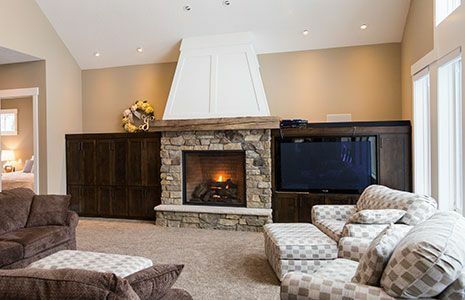 We specialize in fireplace surrounds and mantels, entertainment centers, bookcases, and unique storage cabinetry. Entertain in style with custom cabinetry for your wet bar, designed to accommodate your personal style and preferences. 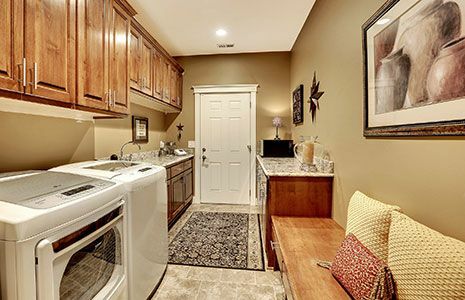 Make life easier with ultimate organization in your laundry room or mud room, customized to fit your family’s exact needs. 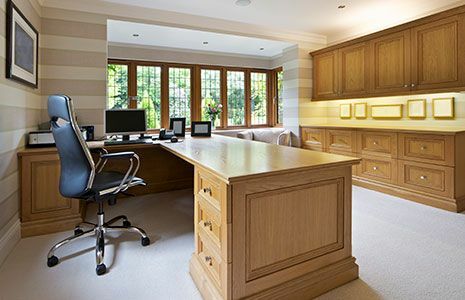 McChesney Cabinets offers specialized custom cabinetry solutions for your home office or other workspaces throughout the home, including craft rooms or workshops. 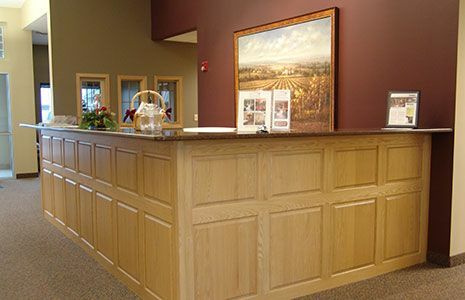 We create custom solutions for reception areas, breakrooms, office building, multi-family housing and senior living, and other commercial or industrial businesses. All cabinets are handcrafted on-site in our Elk River facility with a one-year guarantee on craftsmanship. To simplify your new construction or remodel project, we’ve partnered with top manufacturers of countertops, fixtures, and other materials, including Cambria. We can recommend trusted contractors for plumbing, tile work, electrical needs, and other services. Exceptional materials, the latest design technology, personalized service and attention to detail, and expert craftsmanship – we’ve built our reputation on these qualities. No job is too big or too small. Contact us today. Looking to begin the design process? Schedule an appointment & we'll bring our Design Center right to your door!